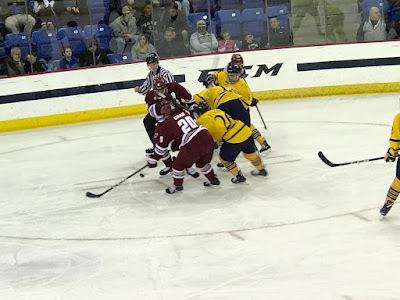 For the third time in the last four weeks Quinnipiac has ended a weekend getting swept as they fell 6-3 to UMass Amherst in at the Mullins Center in Amherst, Massachusetts on the back leg of a home and home series. The Bobcats now have dropped 6 out of 8 games in November, tying a stretch when they lost 6 of 8 games last season. It's not going to get any easier with a short turnaround for a Tuesday game on the road at Princeton followed by Harvard coming to Hamden next Friday. While UMass got a hat trick from senior Niko Rufo, it was the young kids making sure that it was the Minutemen who got the last laugh on the weekend. UMass got the scoring started when Rufo took a feed from Cale Makar at the point and sent a wrist shot past Keith Petruzzelli. A little over a minute later Oliver Chau scoring on back handed five hole goal through Petruzzelli. Quinnipiac on the board when Logan Mick scored his first collegiate goal after redirecting Luke Shiplo's shot past UMass goaltender Ryan Wischow. That was as close as Quinnipiac would come in this game as UMass scored 51 seconds into the second period by Mitchell Chaffee and then 12 minutes later Niko Rufo potted his second of the game. The Minutemen went into the second intermission up 4-1 despite being out shot 35-12. Oliver Chau sent an early dagger through Quinnipiac with a power play goal to make it 5-1, a score that essentially made it impossible for the Bobcats to mount a comeback. Quinnipiac found a bit of life when Alex Whelan blew past the Minutemen's Jack Suter and rifled a shot high past Wischow. The Bobcats inched a bit closer when they scored immediately after Bo Pieper won a face-off back to Craig Martin who dished it over to Brandon Fortunato who blasted home his first goal and point as a Bobcat. Niko Rufo's empty net goal capped the scoring and the win for the Minutemen who improve to 7-6 on the season while Quinnipiac drops to 5-7-1. It was a rough home coming for Keith Petruzzelli a resident of nearby Wilbraham, Massachusetts as he was tagged for 5 goals on 18 shots. The slumping Bobcats now head back into ECAC play on Tuesday when they travel to Princeton before returning home for Harvard and Dartmouth next weekend.